Miss H and I headed to our friend Shadi and Adam’s house for a little playgroup this morning with their son and some other friends. Miss H was the only girl but had fun playing cars with the boys (car! car! car!). Before all the playing began, we had a great waffle and fresh fruit breakfast. We definitely need to use our waffle maker more because Miss H enjoyed the waffles very much. 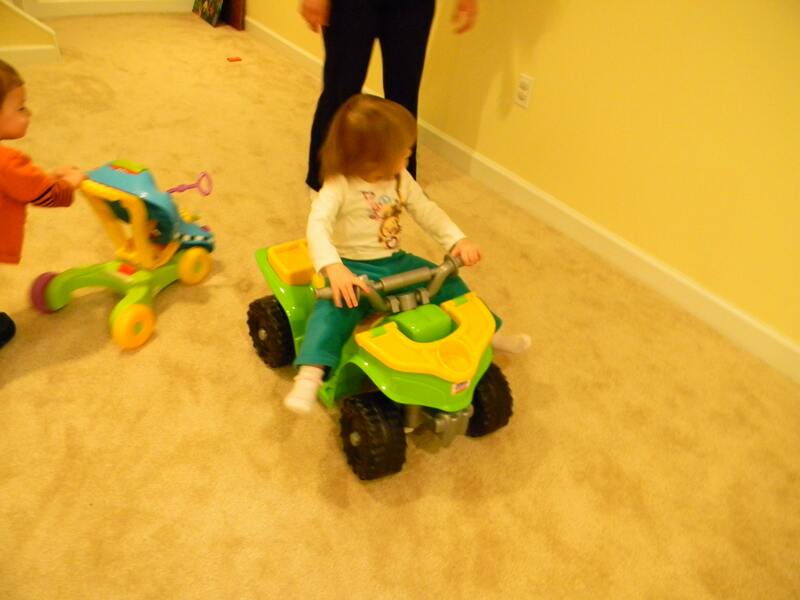 Cy got a motorized four wheeler over the holidays and immediately, Miss H was entranced. I was amazed how quickly she figured out how to turn it on. Her steering was not so great (not at all afraid to run into multiple walls) but she did have fun. Looking forward to another waffle playdate soon! Stopping by from SITS….ARen’t those motorized scooters the best?! How cute that she was really lifting her feet, it must have been helping :). It’s so cute when kids take things too literally and do stuff like that. Adorable!